I have mentioned before how our cat is more like a dog and our dog very much acts like a human. Lacy loves her food, in fact maybe a little too much. Whenever someone walks into her room she runs to the food bowl. It does not matter if she has already been fed that day, she likes to trick people into thinking she is starving. Purina Pet food is close to our hearts, as my Father in law worked for them many years ago. 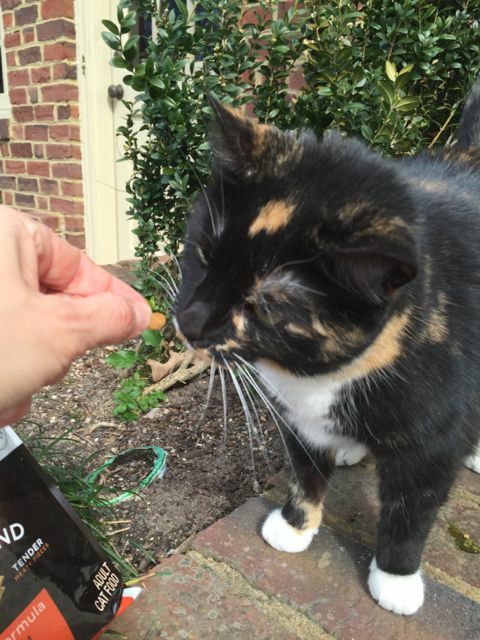 So when choosing a cat food for our active and aging cat we want to be sure she is getting the right ingredients. We have fed our pets Purina Pro Plan before. I told you she is in love with her food. Here she is actually giving it a hug before she even tries it. You can tell by her reaction that she is not afraid to try a new food. I like how the food comes in different shapes as I it must be more appealing to the animal. Here are some reasons why Pro Plan Cat Shredded Blend Chicken & Rice Formula is a good fit for your cat. This look must tell it all. She is licking her chops after just a taste of this new formula. There is no doubt we will be buying Shredded Blend Chicken & Rice Formula again. BE sure to check out all the other cat’s reactions after trying this new formula. How do you know when your pet is happy with the food you give them? What do you look for when choosing a quality pet food? Aw, sweet kitty. She does like that new food. My cat ozzy gets can cat food friskies patte. He also gets dry and we just switched him to taste of the wild because the dogs like that one. Pretty cat. 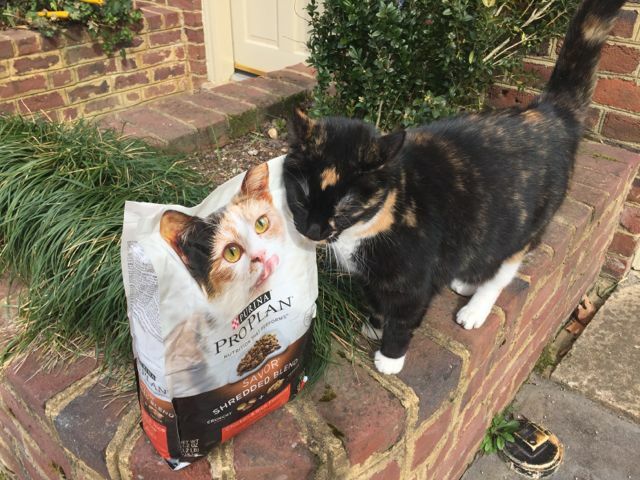 The new Purina seems to make her very happy! Oh your cat is so precious! I love when she is licking her lips! Must be good stuff! We dont have a cat, but I would love to get one! Aw! I used to have a tortie – I thought she was beautiful but my friends used to tell me it looked like someone threw bleach on her 🙁 or that she looked like she should be in a burn unit. The Purino Pro Plan sounds like a great, healthy cat food. My parent’s cat might enjoy it! We have a cat and I always wonder what the best food for him is. He’s not picky, but sometimes I wonder what is THE BEST. I’ve been looking for a new food for my kitty, I think I will give this a try. My cat Penny meows at her bowl she needs food with fiber. These cats are so adorable! I look for a cat food that has quality ingredients and is nutritious! My cat’s aren’t terribly picky although they do prefer the dry food and will hardly ever eat wet or canned food. Your cat is beautiful and she looks very happy! My dog wags her tail when she loves her food. So cute! Makes me wish I still had my sweet kitty! What a pretty kitty! I don’t have cats anymore, but hopefully I’ll get to a place where I can have a couple. I look for pet food that has quality protein, great reputation, and is made in North American. Your cat is so cute! I know my cat is happy when she is constantly begging for more food! I know my pets are happy when their bowls are empty! It’s important to find a balanced diet that they actually enjoy. If my cats don’t like their food, they just don’t eat it–and try to eat off of our plates instead! My dog’s love Purina ONE and Purina Pro Plan Shredded Blends. I have been feeding this for years. I’m looking forward to introducing this to my cat. He’s very picky and actually only likes Purina. Such a cute cat. This would be great for my daughters cat. Such a beautiful cat you have!! I know my kitty would love this! Your cat is so cute. My cats would love to try this new food. Lacy is adorable and enjoys her Purina Pro Plan. I make sure to get high quality ingredients for my kitty. This cat food looks very healthy! I want to try this brand out next time. Thanks for sharing. Haha great last picture!! 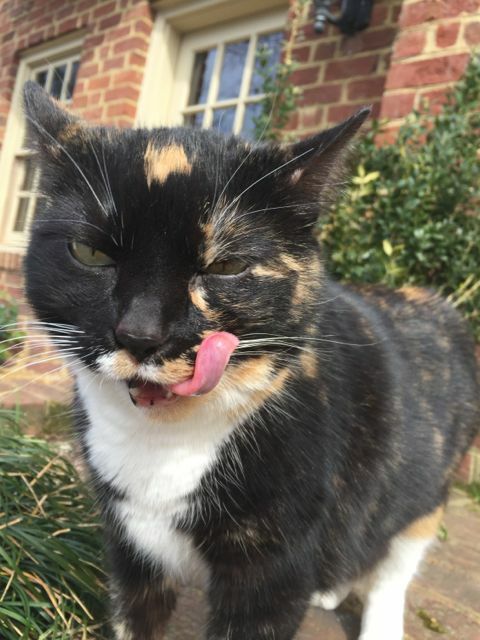 Looks like your cat enjoyed the food! This sounds wonderful and so healthy. It is good to know it tastes good, that they will eat it, as so many times you try something and they won’t touch it! My dog uses purina products and I have been very impressed with their dog food, so I imagine the cat food is just as good! Pretty kitty, my cat is so picky it’s tough to get her to try new things. Baby is pretty finicky when it comes to eating. She tends not to like shredded wet food but since this had dry bits as well I might give it a try. Hopefully they will have a small bag or can that I can try out first! You’re so lucky your cat is willing to try new things like that. I love how she licked her chops too! What a cute cat you have. Im horribly allergic but they are so cute! I’ve heard a lot of good feedback about Purina and it’s awesome! I’m sure my pretty cat would love this one. 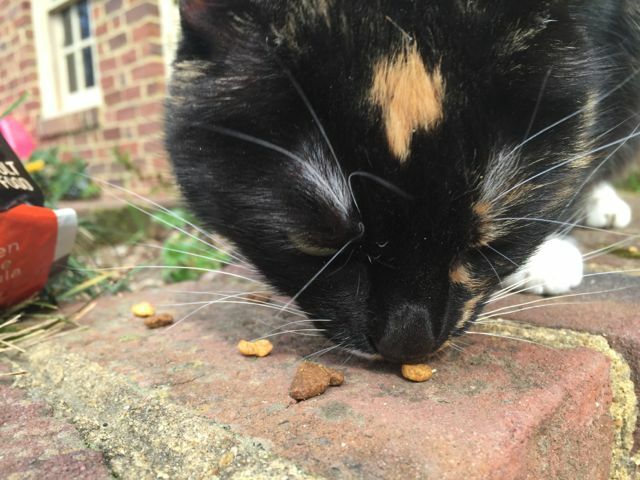 I look at the benefits of the food for my cat. She’s an indoor cat, so we do have to watch her weight (since she isn’t as active as an outdoor cat.) She’s also getting older, so I know I have to be aware of that. What a pretty cat. I have three cats and I would have to gradually introduce this new food to them or they’ll get sick. I’m going to pick up a bag and see what they think! My cat would probably love this food. She is not picky and has liked other Purina foods that I have given her. She’s a gorgeous calico! We have 5 cats that also love to eat and try new things. They like other shredded food – I bet they would like this. Your cat is gorgeous, and quite the model. He truly seems to enjoy that food!